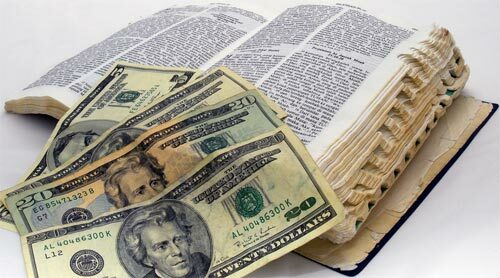 The Bible is careful to outline several pieces of financial wisdom that are surprisingly appropriate for modern times. Although the farmer’s fields are full of delicious livestock, he must recognize that these are valuable assets that have the potential to increase his income and offset his expenses. In this instance, instead of feasting on lamb, the farmer is encouraged to sheer them for wool. Instead of eating the goats or trading them for luxury goods, they are to be used to pay rent (or mortgage) on his fields. By maintaining our assets and putting them to work, the Bible shows us how to prosper. Specifically, this passage is warning the reader not to get into debt. Once you accrue debt, you will be paying interest, and collections will be made upon your house. There were no credit cards two thousand years ago, but consumer debt still existed. Having a savings always makes sense. Pay your employees, and compensate fairly the people who have helped you. Do not trample on society or other people as you gather wealth. In time, all those who follow the advice of the Bible will be able to build their metaphorical “second floor,” if we do so with fairness and diligence. If you are fortunate to be running a surplus past your base expenses, it it encouraged that you might give back to the society that has housed and helped you get so far. Many organizations that do great things rely solely on the generosity of their donors. Although the Bible often encourages tithing to your church, this passage in particular, suggests something more broad. It urges people to give back to their town, their community. This can be in donations to the schools, the theaters, the museums, or the churches. The next time you are seeking sound financial advice, and you use prayer, consider asking for financial wisdom, as opposed to quick windfalls or gains. The Bible offers much terrific advice on the matter, indeed. Amen! Well said. May those who call in asking for prayer for material things they want, but don’t need, all take a mission trip some time to Haiti or some other like place. I believe that Corinthians 16:2 was talking about saving money week by week for those who wanted to help fund church planting or to give money to help persecuted Christians in another part of the world. I think it is a letter from Paul- he wrote so many- that said he would be coming and if they had money he would take it with him to those who were in trouble but they needed to start saving so they didn’t have to scrimp and scrounge for it when he showed up. Everything else was sensible and true.